Capital of Trentino Alto Adige and one of its most important hubs, the many things to do and places to visit in Trento make it for a perfect stop in the region. Whether you are planning a holiday in the Dolomites or a trip to discover the other beauties of the Trentino region, you can’t miss a trip to Trento. We stayed in Trento three weeks, making it our base to explore the region. This had two advantages: it’s well-connected to the other provinces as well as the Dolomites by public transport and there are so many things to do in Trento that we had something to see every day. Read on and discover this dynamic city with us. If you ask me, Trento has it all. History, art and nature, whatever way you want to spend your Trento holiday, you will be covered. Visiting places like the Duomo, Castello del Buonconsiglio and the internationally-renowned Museum of Natural Science, you can discover the local culture. Taking some easy day trips from Trento, you will be immersed in their breathtaking nature. 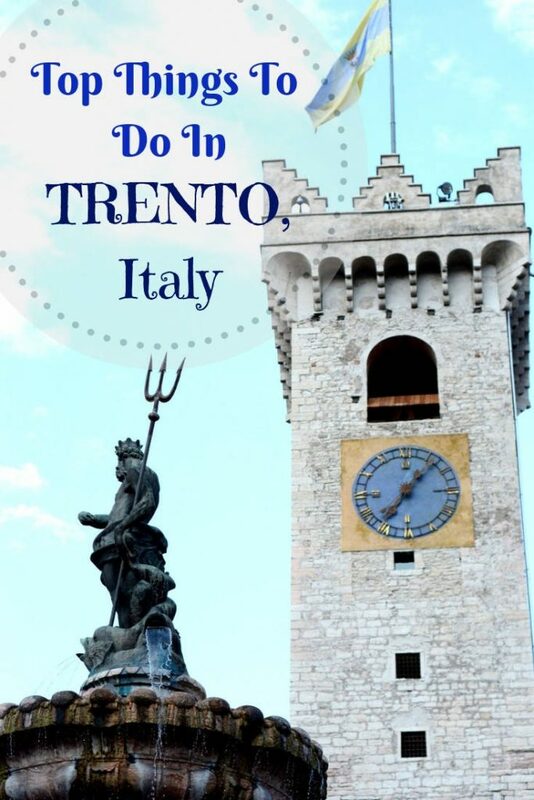 Castles, churches, ancient ruins are only some of the things to see in Trento. 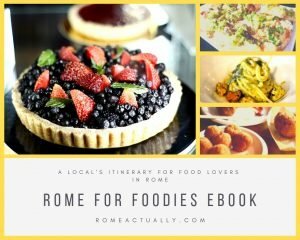 Here is our city guide for first-time visitors as well as for those of you who wish to discover more. 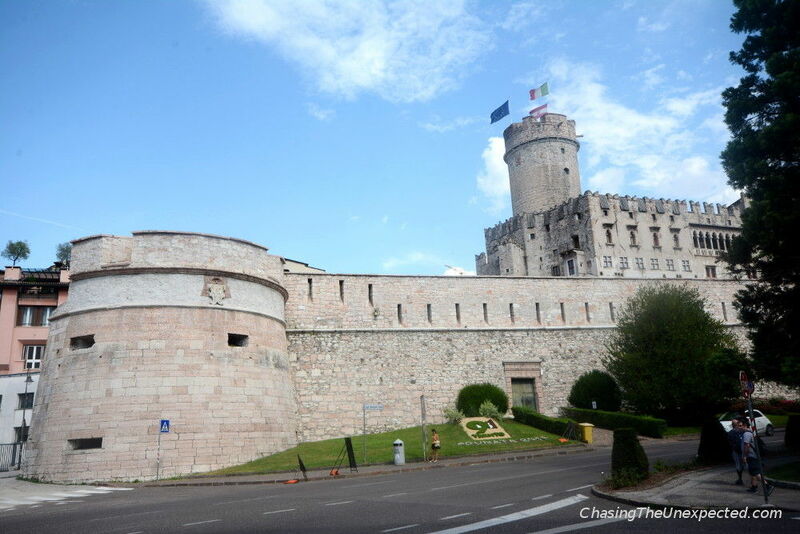 The Buonconsiglio Castle is by all means one of the very first places to visit in Trento. The residence of the local Prince-Bishops, this is the most important castle in Trento and Trentino region. The most ancient part of the castle dates back to the 12th century, while other parts like the Aquila Tower were built in the 14th century. The Aquila Tower is very beautiful as it’s fully decorated on all its walls with wonderful frescoes depicting the cycle of the months. The frescoes are a great example of the local Gothic art and depict the noble as well as farmers’ life of the end of the 14th century in Trentino. The castle is very big also because every century, every new occupant added sections, areas, halls, decorations, paintings and frescoes. During WWI, this is where the process to irredentists Cesare Battisti, Fabio Filzi and Damiano Chiesa took place. The three were executed in the courtyard of the castle. Today Castello del Buonconsiglio is the venue of several temporary exhibitions. Address: Via Bernardo Clesio, 5. Opening hours: Summer 9.30 am-5 pm, winter 10 am-6 pm. Closed on Monday, January 1st and December 25th. Entrance fee: Adults 10€, for over 65 8€, between 15 and 26 years old 6€. To visit also Torre Aquila is 2€ extra. INSIDER’S TIP: If you are staying in Trento or other Trentino cities for at least two nights, you are entitled to the Trentino Guest Card, included in the stay. It will give you free entrance to several landmarks in Trento and Trentino and public transport including some trains and cablecars. Click here for more info and to see what hotels joined the initiative. The heart of the city is in Piazza Duomo, from where all roads start and where they meet. In the middle is the Neptune Fountain and all around are the landmarks symbol of the city. First you will see the imposing Cathedral of San Vigilio and the Museo Diocesano Tridentino inside Palazzo Pretorio. Further turning around the fountain are the impressive Cazuffi Rella houses. Decorated with beautiful Renaissance frescoes representing Justice and Fortune, they are a perfect subject for the photographer in you. Cattedrale di San Vigilio is one of the most important Trento landmarks. The construction of Trento’s Duomo started in 1212 by the will of bishop Federico Vanga, who contributed in developing the arts and the urban planning of the city. The aim was to build a new Duomo on top of the early-Christian Basilica of San Vigilio that we can visit today in the undergrounds. The style of the cathedral was Romanique, and the project was commissioned to Adamo d’Arogno. The ancient basilica was built by Bishop Vigilio to give a resting place to three martyrs killed in Val di Non in 397. Here is also where the Bishop Vigilio, after whom the cathedral has been named, has been buried, next to three saints. Trento cathedral is also where they issued the decrees of the Council of Trent that took place between 1545 and 1563 as a Counter-Reformation compelled by the Protestant Reformation. 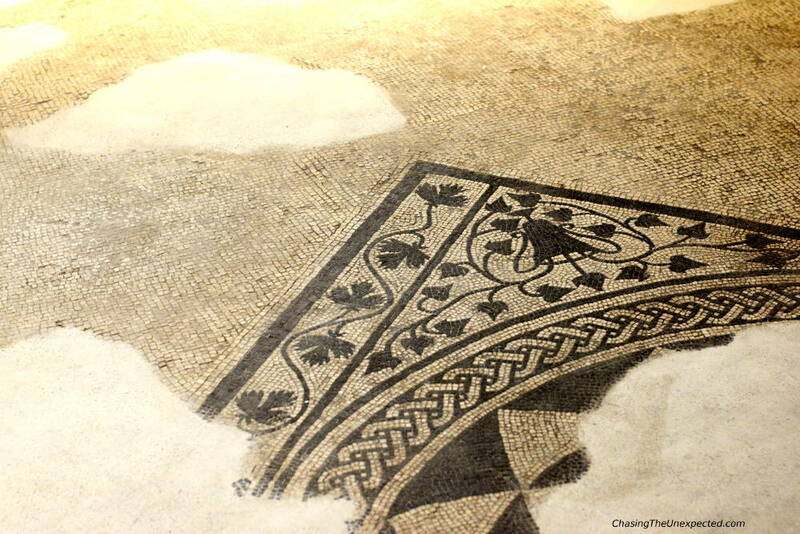 Don’t miss the early-Christian Basilica in the undergrounds of Trento cathedral. You can access from a small door near the Duomo. Opening hours: The Duomo is open daily 6.30 am-12 pm, 2.30-8 pm. Visits are not allowed during the functions. The archaeological site of the underground basilica is open Monday-Saturday 10 am-12 pm, 2.30-5.30 pm, closed Sunday, 1st and 6th January, Easter Week and Easter Sunday, 26th June, 15th August, 1st November, 25th December. Entrance fee: Free for the Duomo, 2€ for the underground basilica. Free with the Trentino Guest Card. Right beside the Duomo is the Museo Diocesano Tridentino, one of the main Trento tourist attractions. Set in the Pretorio Palace, it was the main bishops’ residence in Trento. At the Museo Diocesano you will see a pretty vast and diverse collection of artwork dating back from the 13th to the 19th centuries. 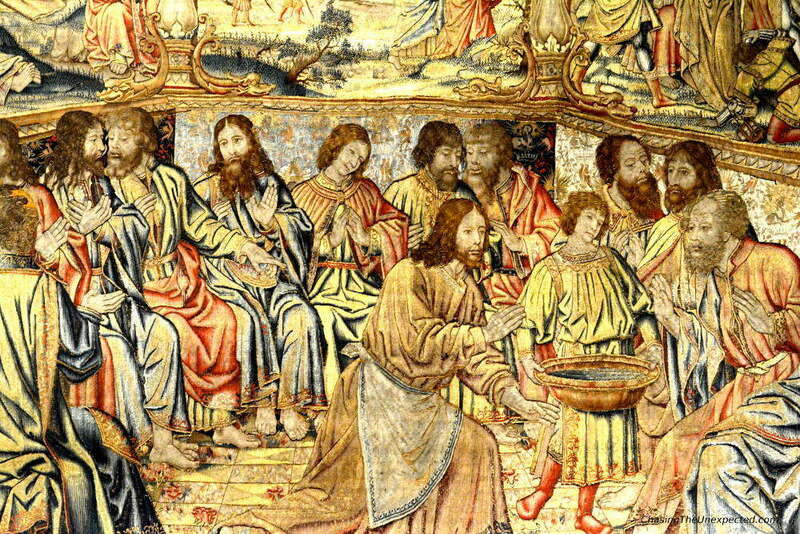 On displays are paintings, wooden sculptures, polyptych altarpieces (Flügelaltäre), precious gold articles, ancient embroideries, liturgical vestments, Flemish tapestry from the 16th century. There is also a section devoted to icons and testimony of the Council of Trent. Upstairs in the Museum you will find a door from where you can access a narrow balcony to have a view inside the Duomo. Address: Palazzo Pretorio, Piazza Duomo 18. Opening hours: Summer daily except Tuesday 10 am-1 pm, 2-6 pm. Winter daily except Tuesday 9.30 am-12.30 pm, 2-5.30 pm, Sunday 10 am-1 pm, 2-6 pm. Entrance fee: Adults 7€, 2€ for university students and younger than 26, 5€ for over 65, free with the Trentino Guest Card. 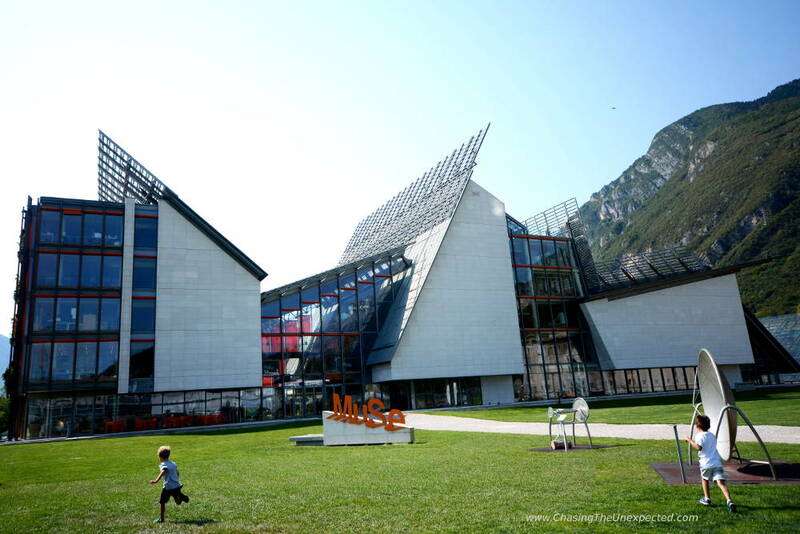 The Museum of Natural Science (MUSE) is one of the best things to do in Trento with kids. It’s divided in several floors, each with a different topics. My suggestion is to start from the underground floor to discover the first traces of life on earth, the DNA and visit a fantastic reproduction of a tropical forest in the hot and humid tropical greenhouse. The ground floor has a space for interactive science your kids will love, while from the first to the third floor you will discover the Alpine world, its prehistory, sustainability and innovation, the geology of the Dolomites mountain range, its resources and biodiversity. The fourth floor explores the world of glaciers and the living organisms in the different climates. Address: Corso del Lavoro e della Scienza 3. Opening hours: Tuesday-Friday 1- am-6 pm, Saturday, Sunday and holidays until 7 pm, Monday closed. Entrance fee: Adults 10€, reduced 8€. Family fees: 2 parents with underage children 20€, 1 parent with underage children 10€. The Albere Palace is right in front of the MUSE. So if you are not too tired, this is also one of the worthy Trento attractions. Palazzo delle Albere is a 16th-century palace built by the will of prince-bishop Cristoforo Madruzzo between 1550-1560. Its name comes from the two lines of poplar trees that led to the entrance. This is a beautiful noble residence that during the Council of Trent was place of feasts and tournaments to welcome princes and ambassadors. Today it’s the venue for temporary exhibitions (we saw a fantastic one about the First World War). 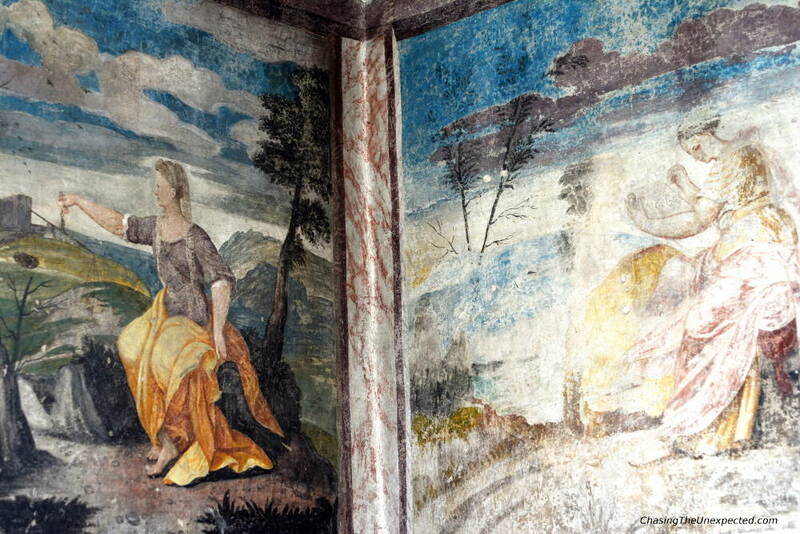 On the walls of the first and second floors you can see stunning frescoes from the 16th century. Address: Via Roberto da Sanseverino 45. Opening hours: Tuesday-Friday 1- am-6 pm, Saturday and Sunday until 7 pm, Monday closed. Santa Maria Maggiore is the church where the main gatherings in preparation of the third phase of the Council of Trent took place. It was built between 1520 and 1524 with a project by Antonio Medaglia commissioned by the prince-bishop Bernardo Cles. 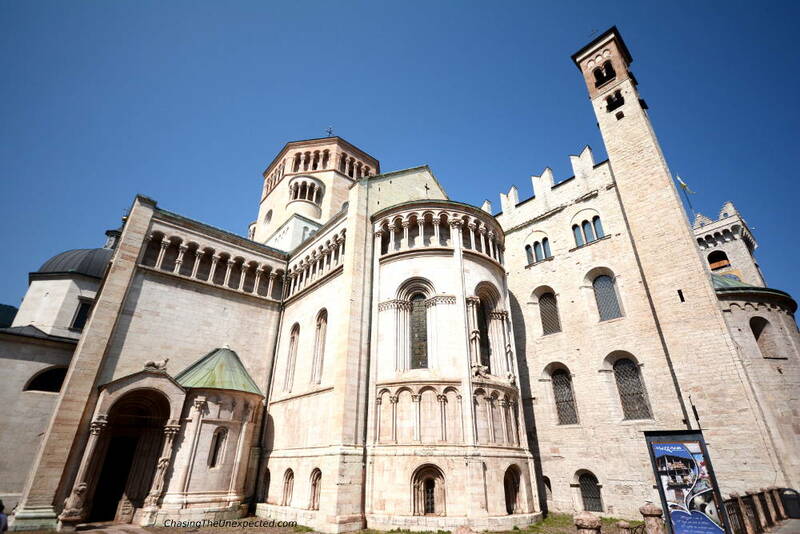 This church is what to see in Trento for history buffs. Like many churches, it was built on the ruins of the ancient city, which here was the Forum of the Roman settlement Tridentum. 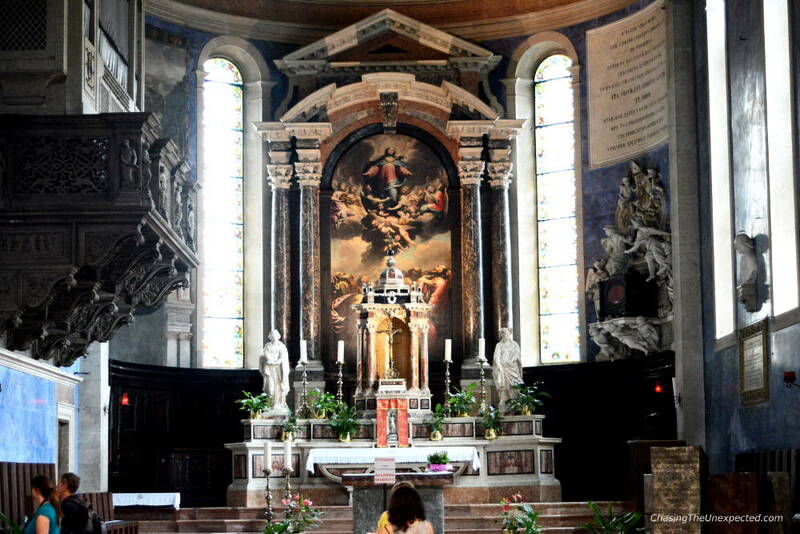 A beautiful pipe organ by sculptors Vincenzo and Girolamo Grandi, the altar by Giovanni Battista Moroni, Pietro Ricchi, Francesco Unterperger and Giambettino Cignaroli, and paintings by Giovanni Maria Falconetto decorate the interior. Address: Piazza Santa Maria Maggiore. Opening hours: Daily morning and afternoon. In Trento the Trentino’s Alpine Mountaineers Society set up a museum in the city centre right near the train station in Piazza Dante. Their aim is to display the history of the group and the relationship with the local irredentism. From the mountains of Trentino Alto Adige, the residents experienced both World Wars the harshest way. The life in the trench was extremely hard and still alive in the collective memory. This is why they devoted one of the sections of this museum to the fight and like during WWI in the mountains. You will see documents, weapons, objects, the luggage they carried up in the mountain during the war, letters, uniforms and more. 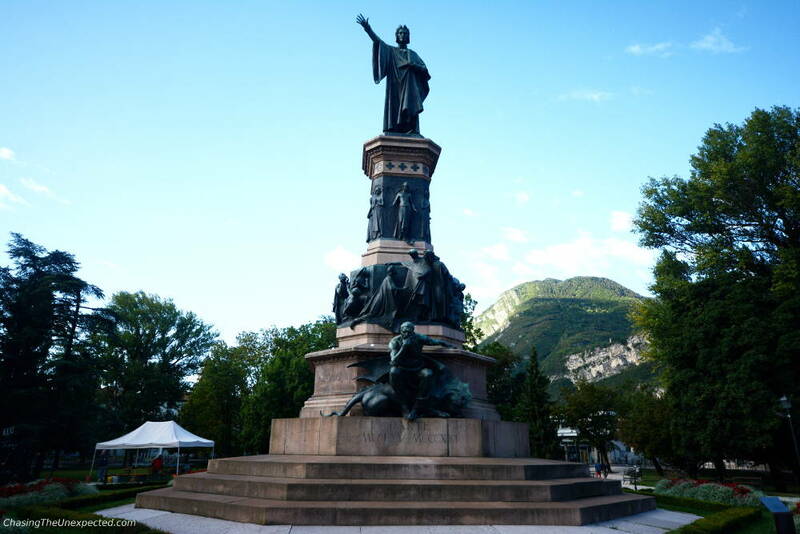 Although close to my hotel, it didn’t capture my attention among the places to see in Trento. I entered almost by chance but I’m truly glad I did. Opening hours: Monday-Friday 9 am-1 pm, 2-6 pm. Just like many parts of Italy and Europe, also in Trento you can visit some Roman ruins. 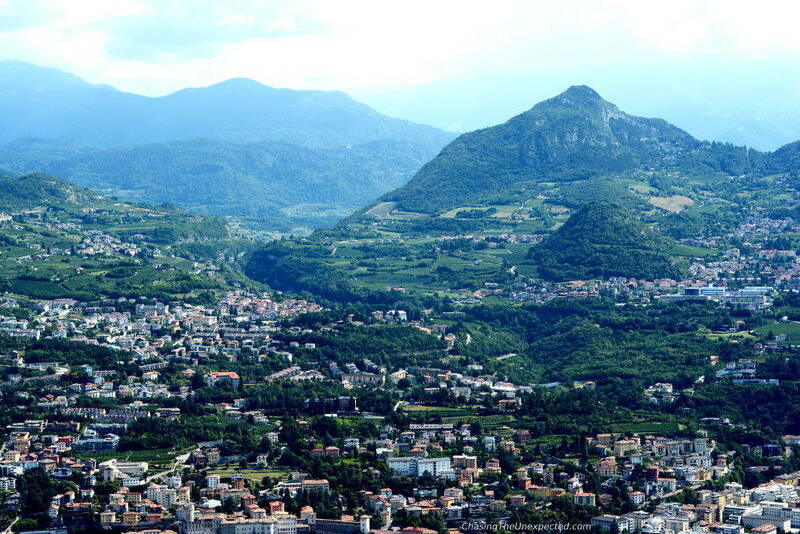 You will see the ancient Roman settlement of Tridentum, the name Trento was founded with. 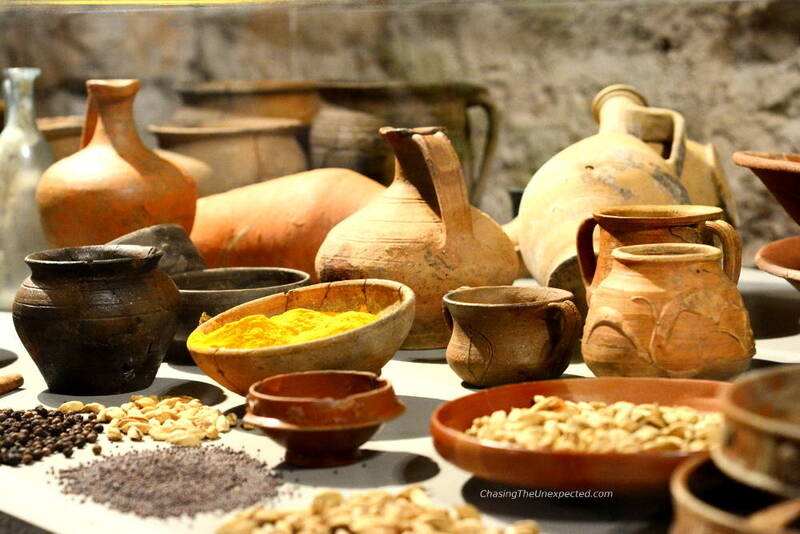 This fantastic archaeological site shows the urban planning of the ancient Tridentum as well as a fascinating itinerary into the daily life in Trento in Roman times. 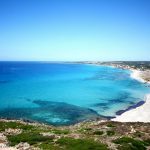 You will have the chance to see pieces of the ancient streets paved with large stones, the sewage system and even some private spaces including a house (domus). Definitely one of Trento landmarks I suggest visiting. Opening hours: 9.30 am-1 pm, 2-6 (in winter opens at 9 am and the afternoon until 5.30). This is linked to the S.A.S.S. as it’s another archaeological site underground Trento. Here you visit a district of the ancient Tridentum, it’s basically the continuation of the site described above. The site consists of different areas like a section of the southern city walls, a stretch of a road, a tower, a private house with its heating system, a house where it’s visible also a rare example of sitting toilet, and a wine shop. Address: Piazza Lodron 31. Don’t be mistaken, the main entrance is in common with the bank Banca Popolare-Volsbank. For the archaeological area is a different door after the main entrance. Opening hours: Wednesday, Thursday and Friday 10 am-12 pm, 2.30-4.30 pm. Closed on holidays. Close to the MUSE and some 10 minutes walk from the city centre is the big monumental cemetery. The construction of the cemetery started in 1826 and includes a main chapel dedicated to the Redeemer and several smaller chapels. There are also different themed areas such as the memorial for the war victims. Many tombs are decorated with sculptures by artists such as Andrea Malfatti, Stefano Varner, Stefano Zuech, Eraldo Fozzer and Othmar Winkler. This is one of the unusual places to visit in Trento but the artwork makes it worth it. Opening hours: Daily 7 am-7 pm, in winter until 6 pm. This is the place of the public gardens. In fact, you will see families with kids playing especially on weekends. In the middle is a tall monument statue of important Middle Age Florentine writer Dante Alighieri. Right here, every Saturday morning from 7.30 am to 1 pm (holidays excluded), they set up an organic veggie market. On the other side, there are dancing fountains and some benches to enjoy the greenery. 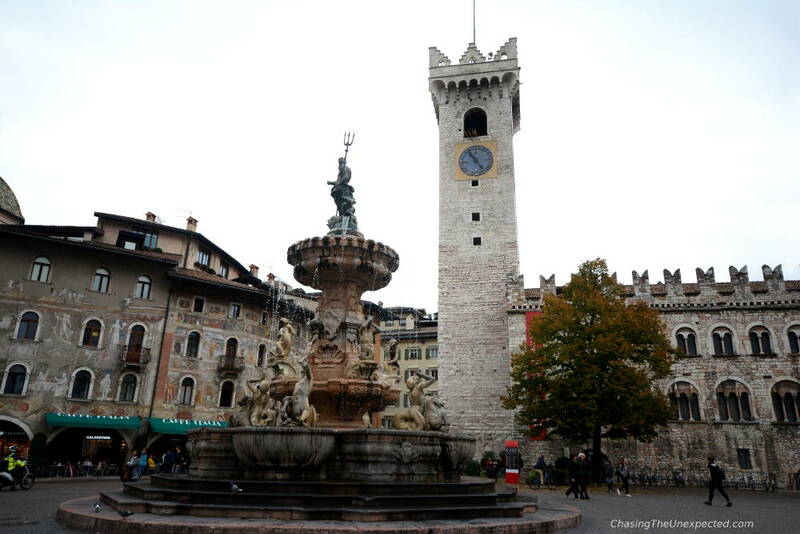 The piazza is located between Trento’s main train station and Trento Grand Hotel, which was where we stayed. Inside the gardens there is also a small coffee shop for drinks and casual snacks. Sitting in one of the benches is what to do in Trento if you are after some relax. On a clear day, take the cable car and climb up to Sardagna for a full view of Trento and the Bondone mountain up close. It takes a few minutes to go up and gradually the view of the city and the mountains unfolding both sides is very beautiful. Once up in Sardagna, known as Trento’s panoramic terrace, you can have a walk around the little village, the natural path that keeps going up on the hill and have there coffee or lunch. Sardagna is some 600 metres from sea level. When the cable car is going up it seems going right on the mountains. So if you high altitudes make you dizzy, you probably shouldn’t do it. Address: From the main train station you head towards Piazza Da Vinci and the Adige river. On the Lung’Adige Monte Grappa, right before Ponte San Lorenzo bridge, you will find the cable car station close to a bar. Opening hours: Daily 7 am-10.30 pm. Fee: If you have the Trentino Guest Card, the fee to go up is included, otherwise a normal bus ticket will do. We tried quite a few restaurants in Trento. One that saw us several times is Antico Pozzo (Vicolo della Sat 6), great pizza, salads, pasta and both fish and meat dishes. Another restaurant in Trento close to the Duomo we tried a few times was Ristorante Chistè (Via delle Orne 4). Also here, very nice pizza, diverse salads, first and main courses. And delicious desserts. If you want to enjoy a vegetarian/vegan buffet, take a bus towards Via del Brennero and enjoy a light lunch at the cafe Pappami, on the ground floor of the shopping centre Top Center (Via del Brennero 320). They have a menu of first and main courses, sandwiches and salads. You don’t fancy anything from the menu? You can compose your own salad. Some of the salads are served on a bread-dish that you can also eat. We liked this place and we went some twice or three times. Simple and very affordable. Worth trying during your Trento sightseeing are also Osteria Le Due Spade (Via Don Arcangelo Rizzi 11) for traditional cuisine, and the restaurant of Grand Hotel Trento for fancy and delicious dishes. We stayed at Grand Hotel Trento and we loved it. This 4-star accommodation in Trento city centre is very comfortable and equipped with all services. The room is modern and furnished with a wardrobe, TV, writing desk, chairs, a small fridge. Included are tea and coffee-making facilities, while the fridge stock is extra. Rooms include independent air-conditioning/heating system and WiFi. Check out our full review of Grand Hotel Trento to know about our experience. Some other good hotels in Trento are Hotel America in the city centre, the luxurious Hotel Villa Madruzzo or the more budget options like B&B La Loggia Del Castello and Al Cavour 34. If you prefer the privacy of a house, some of the favourites are TrentoApartment, Lainez Rooms & Suites and Cinquanta4 Charme Apartment. Search for more hotels in Trento and compare the prices.